well what a session I had, not only did I have to put up with gale force winds but also a full moon.. and to finish it all off, I had 6 runs in the afternoon I had to pack up, they were right on it but I had to leave. For a couple of days I struggled to get rods out, let alone a baited area a couple of times I thought the bivvy was gonna take off!! Just back from a 4 day session on the Orellana. I went with a local lad, a friend I have known for ages but never fished with. We knew it would be hard as easterly winds were forecast and we chose to fish a private finca rather than with a head wind in a busier area. but when the temperature soared to a crazy 30 degrees, it was harder. Between us we had 10 runs, Mine mostly hard fighting upper 20's and Guampe beating his PB with these cracking 39lb and a 41.5lb Commons. 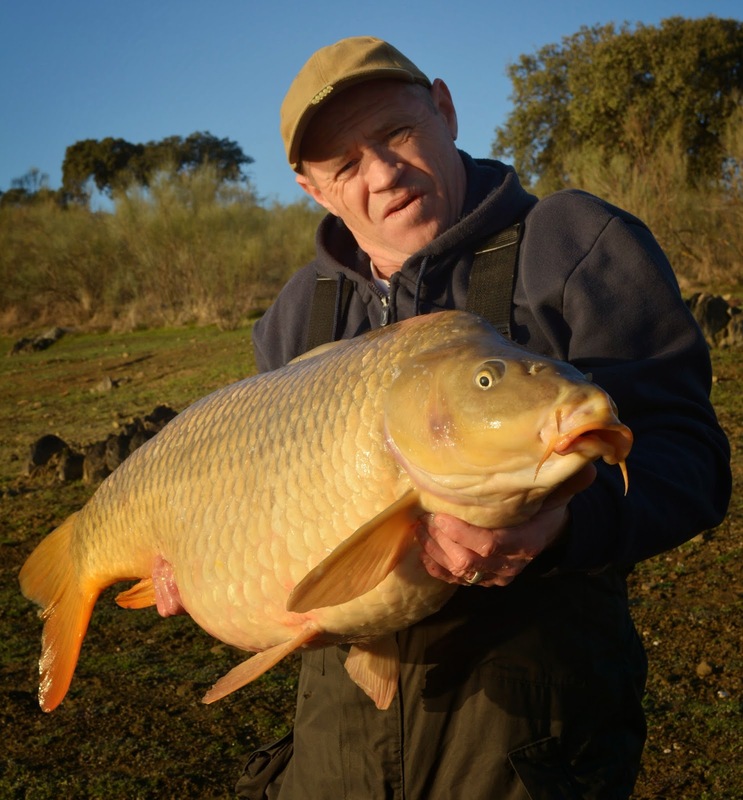 finally were back on the banks of the Orellana. The Dutch lads have been back, their 7th time with us, and great fun as usual. They have had plenty of runs but unfortunately nothing big yet, biggest 34.5lb. The weather hasn't been great for their first couple of days, but that's about to change, so we hope some lumps start to get their heads down. I am actually going to fish 3 days with them, my first serious session for over a year due to illness, my back problem has been diagnosed and a lot better, so here goes. I was hoping to sell but carry on working with the new management, however due to timewasters and dreamers, it didn't happen. With my back being a lot better, finally found out the problem, we are still 'open for business' and have plans to expand our services. The Dutch pair had around 30 runs between them, lots of small fish, mainly upper 20s, Eric had a couple of high 30s, but unfortunately got beaten up as he tried to do some water pics with them. They had been in recovery sacks a couple of hours and unfortunately they were a lot stronger than Eric. Was funny but no photos. Rick and gang have been back again,, they cant get enough of the Orellana,,, even if they weren't blessed with good weather conditions.... Fishing is slow during the depth of winter but the big fish are known to show, however gale force winds didn't help matters, 5oz couldn't hold and hooks were soon blunt. 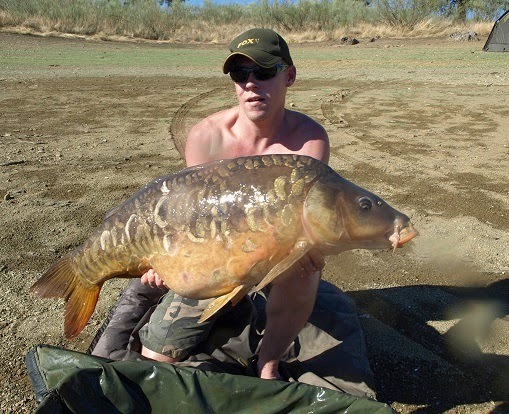 They did manage to runs, Lee landed these at 39lb14 and 42lb 8oz. Rick didn't have the luck, he lost 2 fish, one being a lump, it was well into the 60's. Ricks already planning the next trip and will be over as soon as the weather shows improvement, I shall look forward to it as I will be fishing with him. Getting to good swims can be difficult after rain, not now, we can transport 4 anglers and all the gear in minutes. We already have some access to great... areas through Private 'fincas' however now with the boat, not only can get at other areas with ease, its a back up if there's been heavy rain and access by 4x4 is not an option. There's always the bonus for anglers to have a look at the lake from the water as the boat takes 5 people.